Yes, we are the little red schoolhouse!" 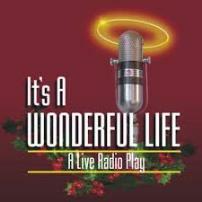 Holiday tradition meets old-time nostalgia in this unique and sparkling version of the heartwarming Christmas tale of George Bailey and his guardian angel Clarence performed as a radio play, as the actors step right up behind the old-style microphones in a radio studio to tell the traditional story in the 1940's way, complete with scripts, songs, and sound effects. "In Loving Memory of Clarence Martin"